Southern Spain embodies all that is typically Spanish...sun-soaked beaches, passionate flamenco dancers, Moorish castles, orange groves, proud matadors and sleepy whitewashed towns. The Costa del Sol is the perfect gateway to this quintessential picture of Spain and offers so much more besides. From the cosmopolitan marinas of Marbella to the top class golf courses of Fuengirola, from the glittering sands of Torremolinos to the lively tapas bars of Nerja, the resorts that make up Spain's 'sunshine coast' offer all ages a fascinating spectrum of sights and activities, both by day and night. 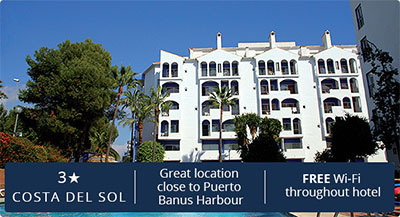 The Pyr Marbella Apartments are located in Puerto Banus, just off to the west of Marbella. When you stay at the Pyr Marbella Apartments you'll have everything you need for a wonderful holiday. Those facilities are wide ranging; the scenery is amazing – the apartments are set in beautiful sub-tropical gardens – and Marbella is on your doorstep. With its shops, bars, restaurants and even a casino all within walking distance, you're all set for whatever kind of holiday you want. And as if all of that wasn't enough, you've got your choice of beautiful sandy beaches too. 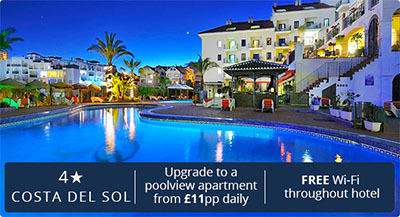 All within a few minutes of the Pyr Marbella Apartments. With a wonderful outlook over the sea, easy access to the beach and the local shops, bars and restaurants, the Gran Hotel Cervantes is perfect. Better yet, it's nicely secluded, giving you a little bit of a breather from everything going on in town. 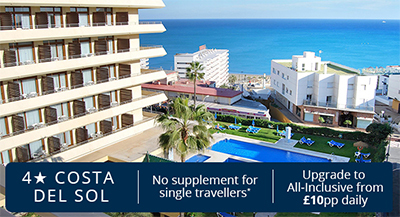 Just a short transfer away from Malaga airport, this perfectly situated hotel is just 250 metres from the lovely beach of Benalmadena and within walking distance to the centre, where a wide range of restaurants and bars are available all year round.